“I hope to calm myself and comfort others through the way of art creation” —— ShinYi Liu. The frequently appearing seaweed-like wavy hair is symbolic to the heavy emotion stuck deep inside and infinitely refined. The warm elegant colors are like girls’ worries brought about from imagination and full of limitless fantasies of the world. Her pieces undergo a long process of tempering and practicing. Each mark of carving shows her constant persistence. Without many decorations, the artist shows simple shape can achieve the effect of comforting people. Children’s innocent appearances and expression not only indicate candidness but also purity and nature. While seeing her works you might feel curious and wonder why there is a strong feeling of self- consciousness. ShinYi Liu compares this to any child living in an ivory tower and struggling with who they are in a constantly changing world as they grow up. The process of artistic creation is always hard. 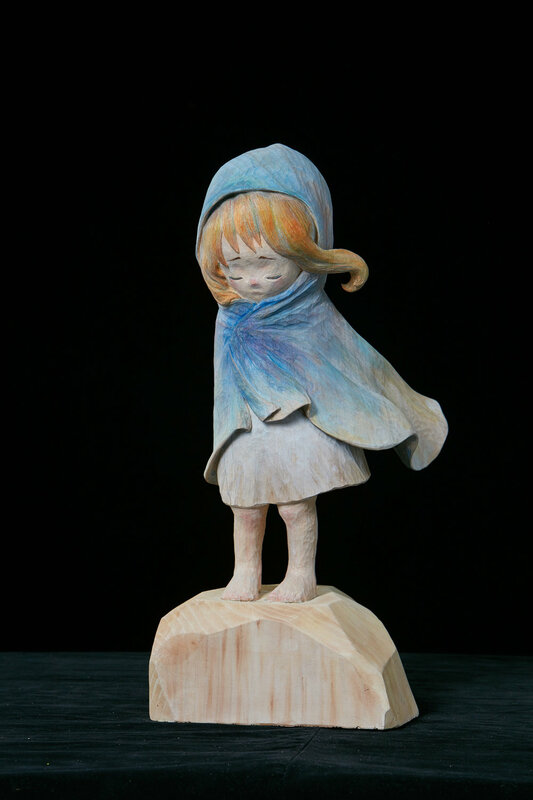 The artist sculpts silently and hopes her persistence will touch others. These works represent her hope of the future and doubts of life. These thoughts are very personal to everyone and impossible for people to answer for others. Her answer is to be capricious in her own time and argue with her inner voice; thus the process of sculpting becomes the essence of being stable. Everyone is different. This is kind of fortune because this colorful world is constituted by those different individuals. Nevertheless, the essence of people is the same, which is another fortune. It is possible to understand and warm each other through this common point by paying full attention. People will always meet some like themselves and some very different. Sometimes, we may feel surprised, sad, or angry when meeting someone who has a different opinion or viewpoint from us. Sometimes, we take joy in this colorful world because of the various people. It is great luck to meet some are similar to ourselves. With this thought, it is easier to find common points in the relationship, care, and give directions to each other. After taking a step back, try finding the time to listen to your inner self. Meanwhile, think repeatedly and work to find a way to continue the life. The most important thing is walking our own path because by being ourselves, we can fight against the complexity of the world. As Shih Yi said, ‘ We have never grown up’, so we can hear the frankest voice of ourselves.